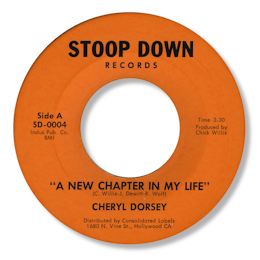 In the early 70s Chick Willis started his own Stoop Down label, based on his risqué hit 45, mainly as a vehicle for his own recordings. The only “outside” artist I know he released product on was Cheryl Dorsey. This 45 has a funk side “If You Want Your Man” which has had some attention from the dance crowd, and a deep side that I much prefer. A New Chapter In My Life has a clear, confident vocal from Ms Dorsey, full of power. She is backed by a rhythm section and occasional bursts from a small horn section. The label gives an address in Hollywood, CA. 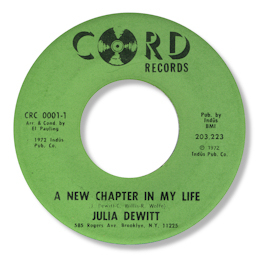 UPDATE ~ Katsuaki Sano has kindly reminded me about Julia Dewitt's original version of this song for the New York label Chord in 1972 so I've dug it out and given it a spin or two. Her version of "If You Want My Man" is sparser and more funkily arranged but sadly I don't like it as much as Cheryl's. Neither does Sano-san. The Chord release which also has the original of If You Want Your Man on the other side was produced by the wonderful Lowman Pauling of the 5 Royales.